Rising Ultimate Fighting Championship (UFC) women’s strawweight contender Mackenzie Dern didn’t fare too well on the scales earlier today (Fri., May 11, 2018) for her bout with Amanda Cooper at UFC 224 this weekend in Rio de Janeiro, Brazil, missing weight by seven pounds. While Cooper wasted little time speaking publicly about the “disgrace” shown by her young Brazilian opponent, she relied on some stone-cold antics during UFC 224’s ceremonial weigh ins (full replay here) when coming face-to-face with Dern. In the above video courtesy of MMA Fighting, Dern can be seen extending her hand for a shake twice. Once before her staredown with Cooper and another time after the two broke eye contact. To Dern’s surprise, Cooper denied both of her handshakes like a trug gangster. Dern came in seven pounds over weight while Cooper did what she was supposed to do to hit the strawweight benchmark. If there was ever a time to snub an opponent of a friendly handshake this was it. Only time will tell if Dern’s significant weight advantage will play a factor in the two’s showdown tomorrow night on UFC 224’s pay-per-view (PPV) main card. Dern will be looking to push her undefeated professional record to 7-0 while Cooper attempts to steal the Brazilian’s momentum and set herself apart at 115 pounds. UFC strawweight Mackenzie Dern has left the camp where she began her mixed martial arts career. Mackenzie Dern’s sophomore Octagon appearance will come at UFC 224 in Rio de Janeiro, as she requested. 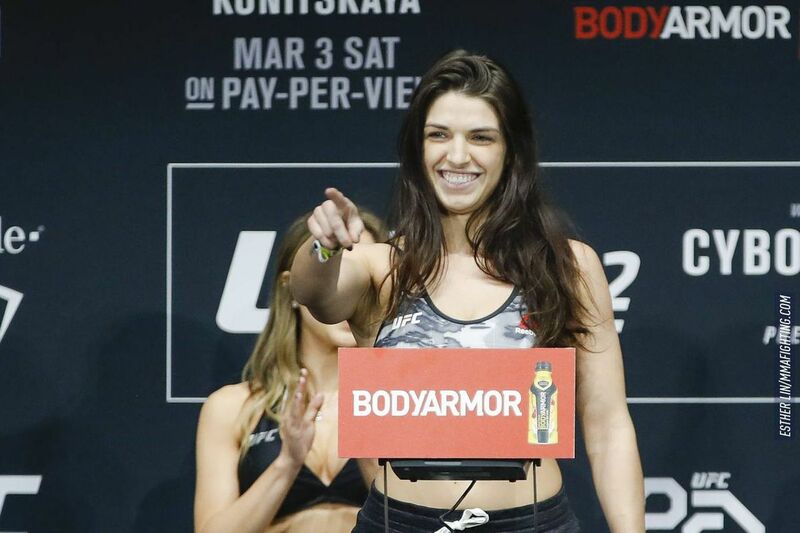 Ultimate Fighting Championship (UFC) is about to spice up its women’s strawweight division with the addition of regional import Mackenzie Dern, the much-hyped jiu-jitsu champion who compiled a perfect 5-0 record in the wake of her pro debut in summer 2016. That’s according to MMA Fighting. After mopping up the cage in Legacy Fighting Championship (LFC), which later became Legacy Fighting Alliance (LFA) thanks to a merger with Resurrection Fighting Alliance (RFA), Dern made a pit stop in Invicta FC, where she promptly subbed Kaline Medeiros. Hoping to make her feel unwelcome is The Ultimate Fighter (TUF) 23 veteran Ashley Yoder (5-3), who also made some noise on the local circuit before getting her feet wet in UFC. Unfortunately, her success under the WME | IMG banner was not unlike her stint on the FOX Sports 1 reality show, as “Spider Monkey” is winless in two trips to the Octagon. That includes last July’s unanimous decision loss to Angela Hill. Dern vs. Yoder is scheduled for the upcoming UFC 222 pay-per-view (PPV) event, taking place Sat., March 3, 2018 inside T-Mobile Arena in Las Vegas, Nevada, though it’s unclear at this time if their 115-pound showdown will be featured on PPV, or relegated to the FOX Sports 1/Fight Pass “Prelims” card. Expect more UFC 222 fight card announcements in the coming weeks. Mackenzie Dern – The Next Big Female Prospect? The post Mackenzie Dern – The Next Big Female Prospect? appeared first on Caged Insider. The sickening sound of shin meeting skull told the audience all it needed to know.